UAV multispectral imagery and satellite data can be used to monitor physiological stress in trees. Researchers from Crown research institute Scion treated selected Pinus radiata with herbicide to stress the trees. The colour of the pine needles changed as the herbicide took effect. 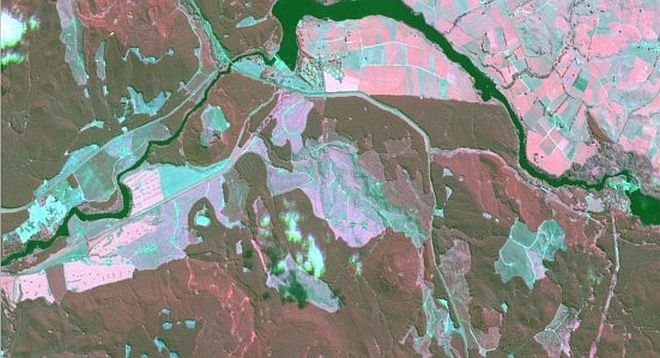 The changes were monitored over time using a UAV-mounted multispectral camera, and using data collected from the Rapid Eye satellite. Resampling the UAV imagery to the same spatial resolution as the satellite imagery showed the differences in sensitivity were not just the result of spatial resolution. Vegetation indices suited to the sensor characteristics of each platform were needed to optimise the detection of physiological stress from each data source. “Detecting physiological stress in forest trees is vital for ensuring productive forest systems,” says Jonathan. Forest owners and managers can now use remotely-sensed data opportunities to augment traditional monitoring practices. This will be especially useful in distant and difficult to access terrain. As well as physiological stress caused by disease, the effects of drought, lack of soil nutrients and attacks by pests will be able to be detected and responded to early, leading to healthier and more productive forests.